The 12th Rajiv Gandhi awards were held at the National Centre for Performing Arts (NCPA) in South Mumbai, and was well-attended by film personalities and politicians alike. The event was hosted by Shreyas Talpade and Mahima Choudhary. Shahid Kapur and Katrina Kaif bagged the Best Actor and Actress awards respectively. "Shri Rajiv Gandhi always supported the youth and so it feels great to be awarded the Rajiv Gandhi Award," Shahid said happily. Next to him, Katrina chimed in, "It feels great when you are recognised for your work." Incidentally, Katrina is reportedly playing Sonia Gandhi in her forthcoming film Rajneeti. Esha Deol, who was missing from the spotlight for a while, performed the inaugural song at the event. She danced to Slumdog Millionaire's Jai Ho, which has become an anthem of sorts. 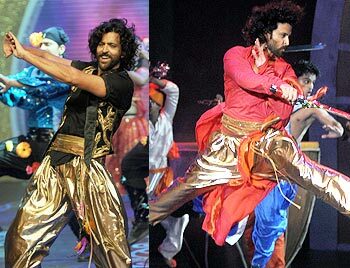 Hrithik Roshan danced to songs from his films, Jodhaa Akbar and Luck By Chance. This is his first stage performance in three years. Priyanka Chopra danced to the chartbuster Desi Girl from her film, Dostana, and the new rage in town, Dhan Ta Nan from her latest film, Kaminey, one of the potential blockbusters of 2009. The actress seemed to be in high spirits, as her career seems to be going very well too. It's not everyday an actress lands a film with 12 characters etched out for her. Yes, What's Your Raashee is Priyanka's vehicle all the way. During her Kaminey performance, Priyanka pulled up Shahid -- her co-star in the film -- up on stage, saying, "The song is picturised on Shahid; I stole it from him. So I thought I will give him some credit." Interestingly, Priyanka has won the Rajiv Gandhi award years ago. "My first award after the [beauty] pageant was the Rajiv Gandhi award, so I feel very excited to have performed here today," she says. 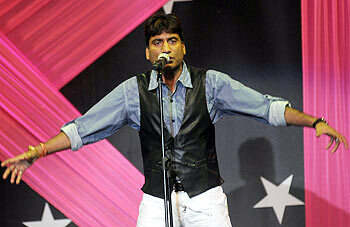 Music composers Vishal and Shekar performed to hit songs and entertained the crowd. The other performers at the event were television star Hussain Kuwajerwala and stand-up comedian Raju Shrivastav. The other winners of the evening were Vineet Jain (Best Industrialist), Ramesh Chandra Agarwal (Excellence in Journalism), Sam Pitroda (Top Global Indian), Dr Narendra Jadhav (for his contribution to Education), Dr G Madhavan Nair (Super Achiever Award) and mountaineer Krushnaa Patil (Women Achiever). 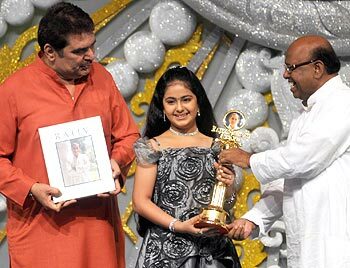 Child artist Avika Gor of Balika Vadhu bagged the Child Prodigy award. The ceremony was attended by political dignitaries like former Maharashtra Chief Minister Vilasrao Deshmukh, Maharashtra Chief Minister Ashok Chavan and members of the Congress party like Murli Deora, Milind Deora, Rajiv Shukla, Priya Dutt, Eknath Gaikwad, Sanjay Nirupam and Gurudas Kamat.